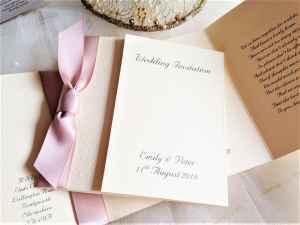 This is just a small selection of Champagne wedding invitations to give you some ideas. The majority of our wedding invitations on the main page are available with ribbon to match your colour scheme. The colour champagne is a name given for various very pale tints of yellowish-orange that are close to beige. The colour’s name is derived from the typical colour of Champagne. As an elegant and luxurious wedding colour, champagne is hot and popular, especial for the new year wedding trends. We stock champagne ribbon in satin and organza. Order your wedding invitations with champagne ribbon today.